Centuries before the Renaissance artists were creating their visions of the world through the use of linear perspective, there existed in ancient China a way of capturing not only the appearance of reality but its spiritual essence as well. The aim of traditional Chinese painting was to show the natural harmony between man and nature. How unfortunate that a distortion wrought by our colonial history has caused us to be so abysmally ignorant of Oriental art, its unique beauty, charm, and appeal. With the prescribed manner of depicting natural phenomena - how to depict bamboo, old trees, mountains, rocks, and water, which was regarded as “the blood of painting” – the ancient Chinese painters could convey vast immeasurable distances between a flowing stream and a mountain peak covered with mist. On a Chinese scroll, the mere speck of a lone fisherman on his boat conveys the illusion of the immensity of space that surrounds him. Not even Michelangelo could have done it. To be sure, none of these works were executed in oils, which were a Western invention, but rather, with a brush dipped in black or colored ink, on paper and silk, and not on canvas. The vitality of the brush was captured through calligraphy, which was considered the highest of the art forms. But today, in contemporary twenty first century, how has the discipline exemplified by the ancient Chinese painters been observed and practiced? To seek the answer, Hiraya Gallery has brought over to our shores a selection of works by the Taiwanese artist Yang Ding-Xian. 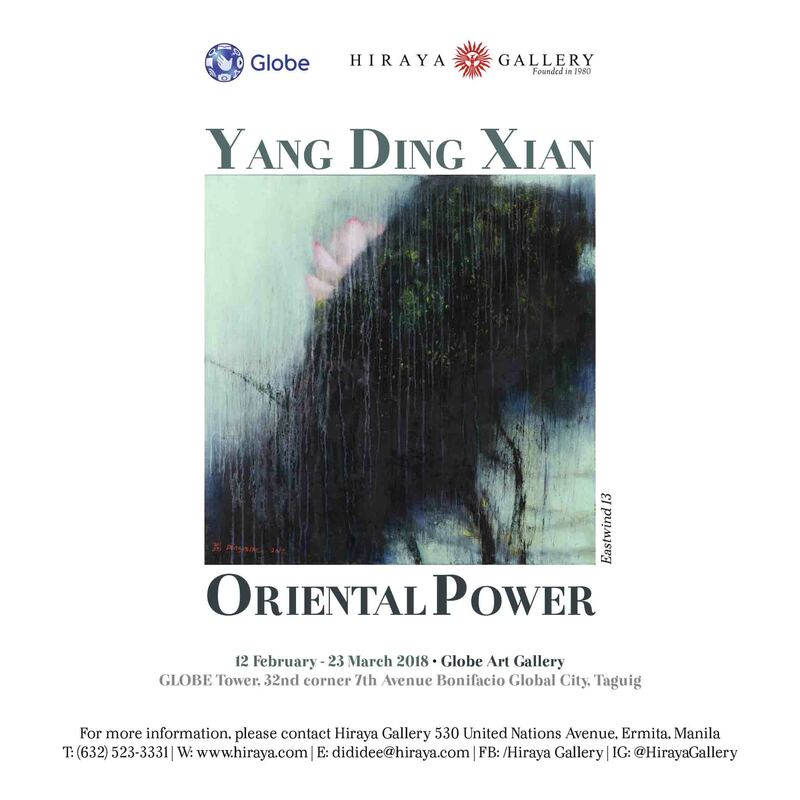 Billed as Oriental Power the show can serve as a refresher course in contemporary Oriental art, and refreshing indeed is the wind that has blown our way, for, to our loss, we have so long been distanced from it by our mad infatuation with Western art. In the exhibited works, Yang Ding-Xian distills the lessons of his artistic ancestors, not to academicize them, but to create affirmations of an unbroken continuity with the ancient past. Not surprisingly, it is calligraphy that remains the fulcrum of his art, which he summons to serve the ends of a sensibility shaped by the recent and current century. A work, for instance, like “Shining Moment,” is pure calligraphy, but the dance of brushstrokes, the articulation of the inky blackness tightening a spreading form, cannot but enlighten us why American artists like Mark Tobey and Morris Graves were so enamoured with Asian calligraphy, so undeniably evidenced by their works. Traditionally, Chinese painting disdained the use of color, regarding it as a distraction, but in Ding-Xian’s vision, a faint yellow passage of pale yellows is not mere intrusive pigment but an aura, an emanation of energies that steam out from the tension of a topography of stifling darkness. Decidedly looking mystical is Ding-Xian’s “Eastwind 13.” A work with a gathering force and impact, it depicts what looks like a single budding lotus emerging exactly as from a pond of muddy waters. One cannot help but be profoundly moved by the simplicity of the image and power of its message.